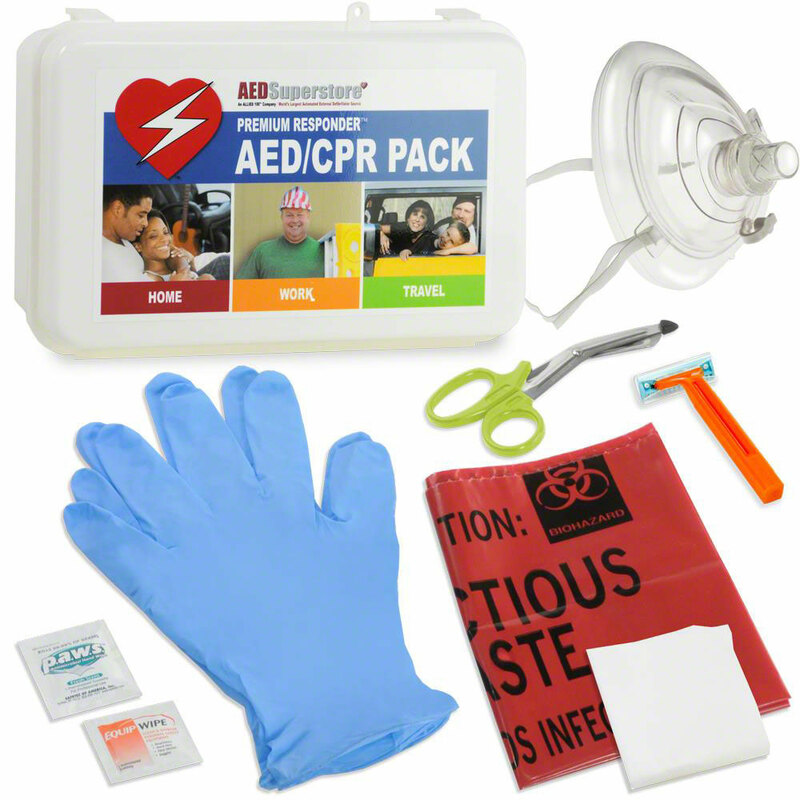 The AED Superstore® Premium RespondER® Pack is the finest you'll find anywhere and has the tools you'll need to prep your patient for CPR and the application of an AED. Saving someone's life is serious business; this is why our kits contain field-proven tools to help you prep your patient for the application of the AED as well as CPR. It also provides you with protection from contaminants during a rescue. All components are single-use, Not made with natural rubber latex, and disposable. 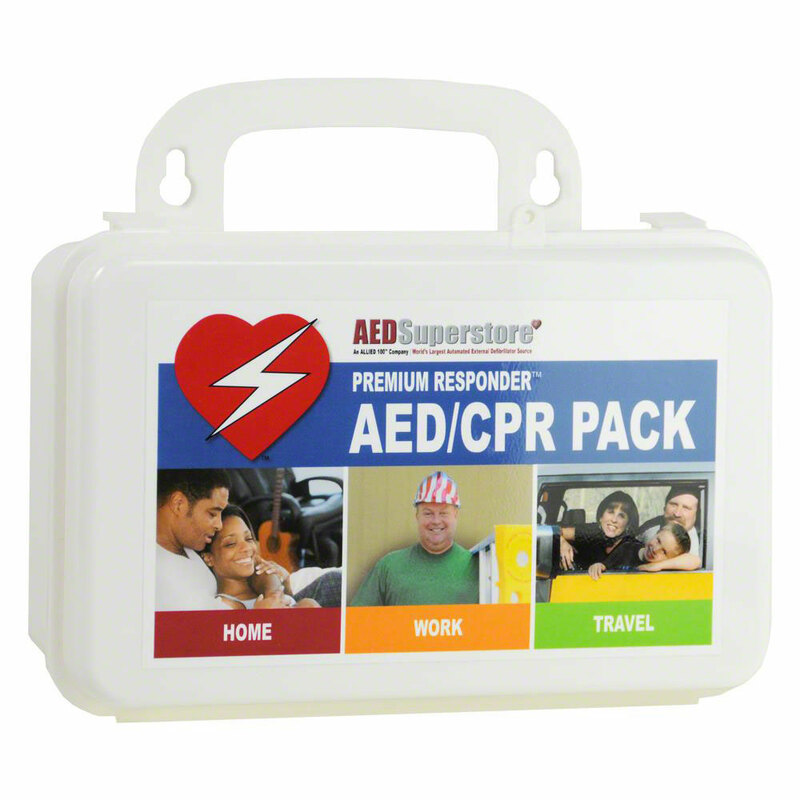 Everything in this pack is contained in a hard case with built-in handle/hanging bracket for easy placement by your AED. Kit measures 8¼" x 5½" x 3". •Quality RespondER® CPR Mask…a tough pocket-style mask with a one-way valve when flimsy face shields just won't do. Includes oxygen inlet valve. •Two Pairs of Protective Gloves…nitrile gloves (not made with natural rubber latex) for one with an extra pair for peace-of-mind. •Pair of Heavy-Duty Emergency Shears…real trauma shears just like those used by medical professionals to cut away clothing. •Antiseptic Towelette…a high-quality, brand name antiseptic wipe, not just alcohol pads as found elsewhere. •Hard Case...with built-in handle/hanging bracket.